The forth release on Antrim’s Or Two Strangers imprint welcomes Claudio Cornejo back to the label for his debut solo single. The Argentinean artist has been a sometime studio partner of Antrim in the past and is also one half of Analog Jungs who delivered the labels third release, ‘Cinematic’. 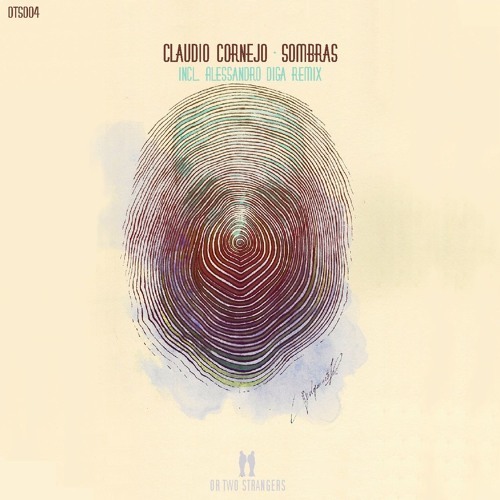 Now making his much anticipated Or Two Strangers return Claudio presents his first ever solo single entitled ‘Sombras’ alongside a remix from Alessandro Diga. Long noted for his progressive minded sensibilities, Claudio explores an extension of that on ‘Sombras’. Anchored by a rough and rugged groove, the track carries a large presence early, before aquatic designs and a wonky lead theme advance the storyboard further into the cosmos. Now beginning to strip down, heavenly pads initiate the main break while sparse but poignant pianos add a new emotive dimension. Soaring modulation brings tension as the beats return before a third act of cross-cultural themes take you home. A stunning creation from Claudio which makes for a most impressive solo debut. The lone interpretation of ‘Sombras’ is provided by Alessandro Diga who is making his Or Two Strangers debut. Martijn van Dijk aka Alessandro Diga has grown into one of the Netherlands most talented artists. He has found a home on quality imprints like Hernan Cattaneo’s Sudbeat Music and Manual Music, where his unique hybrid of progressive house and techno has flourished. Now making his much anticipated debut on Or Two Strangers Alessandro brings his magic touch to ‘Sombras’, closing the release out on a strong note. It’s staggered and funky foundation is immediately appealing while a strong atmospheric presence wavers in the background. Vibrate chord stabs light up the atmosphere before icy pads carry nicely into the main break. Short and perfectly executed, the tracks centrepiece builds to a quick apex with drama at a premium, making for a massive moment and gorgeous third act finale. Superb remix from Alessandro which rounds out another top notch offering from Antrim’s Or Two Strangers imprint. Don’t miss it.